Dermatology devices market is a billion dollars market accounting for a substantial proportion of healthcare expenditure globally. In a new report titled “Dermatology Devices Market: Global Industry Analysis and Opportunity Assessment, 2016–2026” Future Market Insights offers a 10-year forecast for the global dermatology devices market and provides insights on the drivers, restraints, opportunities, and trends likely to govern the global dermatology devices market during the forecast period (2016 – 2026). 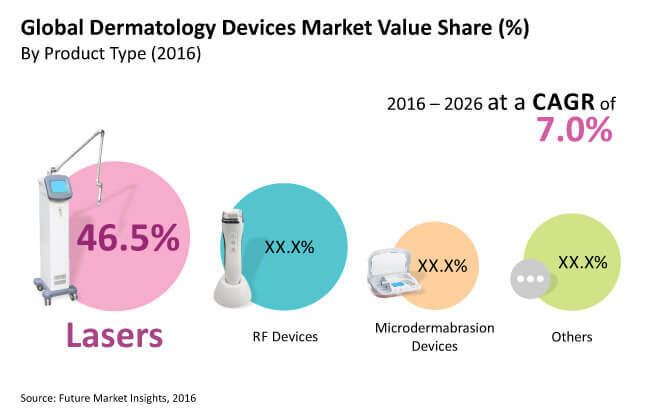 According to Future Market Insights analysis, the global dermatology devices market is expected to reach US$ 2,708.4 Mn in terms of revenue by 2016 end, witnessing a year-over-year growth of 6.2%. Factors such as rising prevalence of skin problems including acne leading to scars, increasing obesity, and growing aesthetic awareness among people are likely to contribute to the revenue growth of the global dermatology devices market over the forecast period. Economic factors such as growing healthcare expenditure, increasing disposable income per capita, and rising government support in developed economies are expected to boost the growth of the global dermatology devices market over the forecast period. The global dermatology devices market is segmented on the basis of Product Type (Lasers, RF Devices, Microdermabrasion Devices, Others); Application (Vascular Lesions, Tattoo Removal, Hair Removal, Wrinkle Removal, Scar Removal, Acne Removal, Others); and End User (Hospitals, Specialty Dermatology Clinics, Private Clinics). The global dermatology devices market is segmented into the seven key regions of North America, Latin America, Western Europe, Eastern Europe, APEJ, Japan, and MEA. The demand for non-invasive cosmetic correction procedures has been significantly high in the U.S. market in the recent years, making North America the most lucrative market globally. In addition to North America, demand for non-invasive cosmetic procedures has been significantly growing in Western Europe and APEJ. Western Europe is expected to account for 20.3% revenue share of the global dermatology devices market by 2016 end. The global dermatology devices market report profiles some of the leading companies operating in the global dermatology devices market such as Valeant Pharmaceuticals International Inc., Cynosure Inc., Lumenis, Syneron Candela Ltd., Avita Medical Ltd., Shanghai Fosun Pharmaceutical Group Co. Ltd., Cutera, Lutronics Corporation, and Beijing Toplaser Technology Co. Ltd. Major market players are adopting different strategies such as product launches and acquisitions to maintain their market share. For instance, in November 2015, Lumenis acquired Pollogen to strengthen and expand its aesthetic products portfolio. Similarly, in May 2016, Alma Lasers launched Accent Prime that combines ultrasound and unipolar radio frequency technologies to provide enhanced body contouring and skin tightening treatments.